Free messages, Free Calls. Unlimited! Now, call and send messages as much as you want! 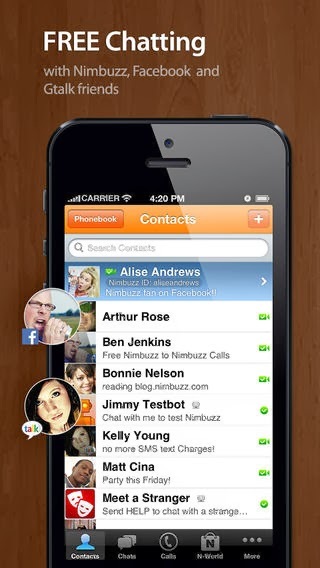 Nimbuzz Messenger combines the power of internet and smart phone messenger into one, and lets you make cheap international voice calls, send unlimited chat messages, share files on any mobile device across popular messengers. 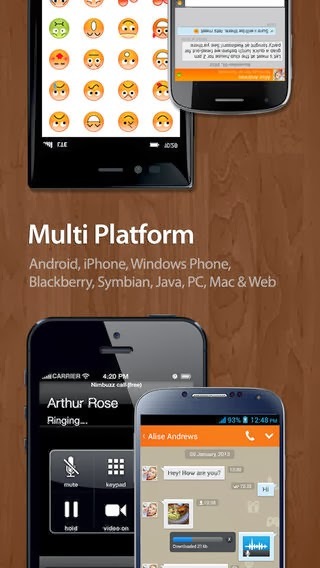 Nimbuzz Messenger is available on Android, iOS, Windows Phone, Blackberry, Symbian, Java, Windows and Mac. • AND MUCH MORE: Custom chat wallpaper, Landscape mode, Contact sorting, improved Presence Icons, File sharing, Precise message time stamps, Chat history, Cheap calls(VOIP), N-world, Meet a Stranger chat (find new friends), Virtual Goods, Free Avatars, Games and much more.